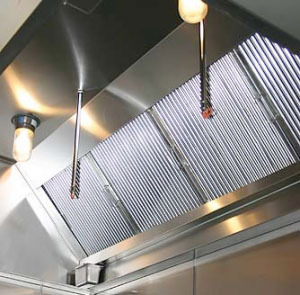 The StateFire DC Specialties kitchen suppression division designs, installs, maintains and inspects industry leading kitchen fire suppression systems to protect businesses and lives. Because it is a statistical fact that there are a lot of fires in commercial cooking facilities, UL 300 Systems have changed to protect the modern kitchen. Having a good fire protection system in a restaurant or institutional cooking facility is more important than ever before. In the last 10 years major developments have changed the ways of commercial cooking. Cooking equipment currently manufactured uses more efficient burners, resulting in much higher heating rates. More cooking is done with vegetable oil instead of animal fats. Vegetable oils have a much higher auto-ignition temperature. Fryers are now made with improved insulation that slows the cooling rate, but which also increases the risk of a re-flash in the event of fire. Service on your UL 300 system is as important as the equipment itself. At StateFire DC Specialties our technicians use a check-list complete with 37 maintenance steps performed during the semi-annual service of your system. We offer 24-hour emergency recharge service. © Copyright 2019 StateFire All Rights Reserved.